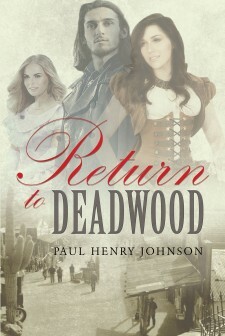 Paul Henry Johnson's New Book "Return to Deadwood" the Western Adventure of a Man Willing to Stop at Nothing to Find His Love in a Lawless Mining Town. Rancho Santa Margarita, GA, February 13, 2018	(Newswire.com) - Paul Henry Johnson, a corporate business transaction attorney, has completed his most recent book “Return to Deadwood”: a gripping and sensational story of the wild west during the gold rush. Steel Madison finds he has a true talent with a firearm, a skill that will be tested as he vows to rescue the woman of his dreams from a den of dangerous enemies. Published by Fulton Books, Paul Henry Johnson’s book begins in 1876 and gold had been discovered in the Black Hills, Dakota Territory. The discovery had birthed the lawless mining town of Deadwood. Steel Madison and his father, Philadelphians, join up with a wagon train headed by Charlie Utter, leaving Colorado with 180 painted ladies for the upstart mining town of Deadwood. Enemies are made, and they experience the dangers of the uncivilized West. Steel goes against his father’s firm counsel and purchases a lead pusher—a Colt pistol with an ivory handle. He is schooled by none other than Bill Hickok, Deadwood’s most famous resident, and soon discovers his innate talents with a gun. Savannah, the beautiful Southern belle, and Cattie, the dark-haired beauty, both stir his emotions. One becomes the hopes of his dreams, only to have such dreams to be tabled by a band of marauding Crow Indians. It’s only by returning to the town of Deadwood—a town that he has come to despise, a town with dangerous enemies—that he has any hope of finding what he’s lost. Readers who wish to experience this thrilling work can purchase “Return to Deadwood” at bookstores everywhere, or online at the Apple iTunes store, Amazon, Google Play or Barnes and Noble.